Bilirubin is a molecule formed from the breakdown of red blood cells, and other cells with porphyrins. Red blood cells carry special molecules, called hemes (a type of porphyrin), which hosts an iron atom. This arrangement allows the red blood cell to carry oxygen. When blood cells break down, they release the heme into the blood, which could do damage if not controlled. Heme is actively broken down in the liver, as seen in the image below. It is first converted into biliverden. Another enzyme continues the process, and converts biliverden into bilirubin. Bilirubin is then deposited into the intestines, via the bile duct. From there it can be excreted in the urine or in the feces. In the intestines it is converted to stercobilin, a reddish-brown substance that gives feces its distinct coloration. In the urine, bilirubin becomes urobilin, a very yellow substance. Bilirubin, because it is related to porphyrin molecules, is a natural pigment. As it changes into different molecules and versions, it also changes color. Scientists can use these colors to detect disease. For instance, a bruise is caused by the pooling of blood under the skin. Pooling blood is a dark red or purple, and will slowly turn more brownish as the iron oxidizes. As the blood is removed and recycled, the heme groups must be broken down. Heme is first converted to biliverden, which has a greenish tint. If you’ve ever had a large bruise that appeared greenish, this is why. After this, it is converted to bilirubin, and has a distinctive yellow color. Old bruises will turn this distinctive yellow before disappearing. The distinctive yellow coloration of bilirubin buildup is a common symptom of conditions like jaundice, in which bilirubin builds up all over the body. This can happen in babies, when the liver has not yet fully developed, or in adults with non-functioning livers. While the yellow coloration of the eyes and skin is a definite sign that something is drastically wrong, a bilirubin test can show the levels of bilirubin long before they become dangerous. Bilirubin is also found in plants, as a breakdown product of chlorophyll, a molecule highly related to the heme molecules in animal cells. It is also very similar to the pigment phycobin, which is used by autotrophic bacteria to capture energy from sunlight. Bilirubin exists in multiple forms in your blood. It exists in a water-soluble form, which is attached to glucuronic acid in the liver by a special enzyme. This makes bilirubin easier to detect and is known as conjugated bilirubin. Unconjugated bilirubin, on the other hand, is fat-soluble, which makes it harder to detect in solution. As such, some of this bilirubin is undetectable. It bonds to itself and other fat-loving molecules. Therefore, a test of a person’s total bilirubin includes the direct measurement of soluble bilirubin, plus the estimated indirect bilirubin. These two forms, and their abundance in the system, can tell a doctor a lot about which process may be getting interrupted in the liver. For instance, a healthy person will have a higher concentration of unconjugated bilirubin, but the exact levels depend on the person and circumstance. Normal levels for total bilirubin can be anywhere from .1 to 1.2 milligrams per deciliter of blood, and the direct bilirubin will only be .1 to .4 mg/dL of that. Conditions of hyperbilirubinemia, or a really high bilirubin level, can happen for many reasons. The total blood bilirubin would have to be much higher than this before this condition would start to appear. Typically, around 10 mg/dL symptoms of bilirubin buildup, such as jaundice of the eyes and skin can be seen. This is around 10 times the regular levels. It could be caused by rapid blood cell loss, a non-functioning liver, or a variety of other condition which stop the liver or other organs from properly processing bilirubin. This condition could also be caused by a blockage of the bile duct, hepatitis, or certain pharmaceuticals which are interfering with the passage or conversion of bilirubin. Your doctor will have many other tests to take into consideration, as your bilirubin levels can indicate many different conditions. Healthy people do not normally excrete bilirubin in the urine. It is normally converted to another chemical, which is much more water soluble. Bilirubin in the urine is a symptom of a number of liver, kidney, and intestinal diseases in which a biological process is being obstructed. Finding bilirubin in the urine can help a doctor differentiate where in the excretory system the error is occurring. There are many factors which will help determine this, including the type of bilirubin found and its quantity. 1. Why is bilirubin yellow and biliverden green? C. It’s their favorite color! A is correct. These two molecules are drastically similar to each other, minus a few atoms and a rearranged bond here or there. It is enough of a change however that light reacts to them differently, and a different frequency is reflected in each molecule. 2. 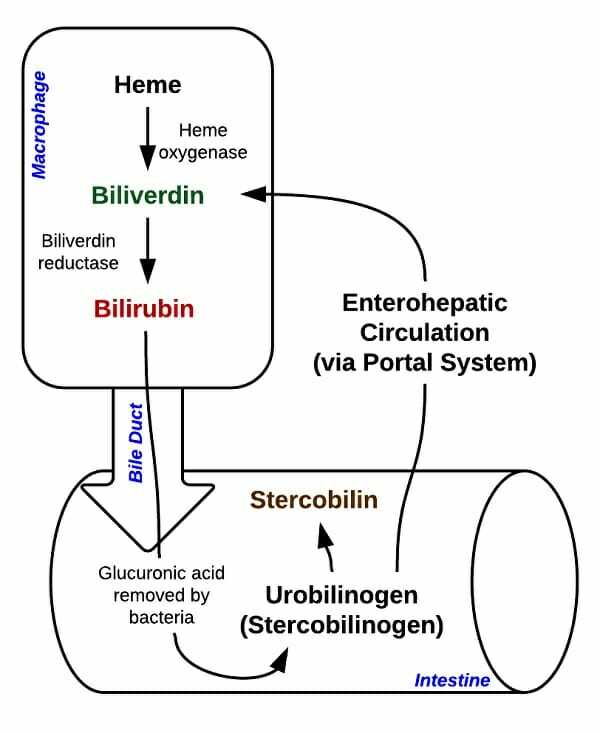 What do chlorophyll, heme, and bilirubin all have in common? B is correct. All of these molecules interact with the frequencies of visible light. As such, they reflect some colors while absorbing others. This makes them appear colorful to the eye. Bilirubin, while it came from a porphyrin ring, is now a linear molecule. 3. Newborn babies often become “jaundiced” or very yellow after birth. Why is this? B is correct. This represents a condition of the liver not being fully developed, usually. While in may represent a more serious condition, many babies have not yet developed the enzymes responsible for breaking down bilirubin. Luckily, this form of jaundice can be treated by light, as bilirubin breaks down in light. After a few days, the liver will become established and should take care of the problem on its own.